Flashman and Afghanistan – plus the Bush, Blair, Obama & Cameron “Barber Shop Quartet”.. 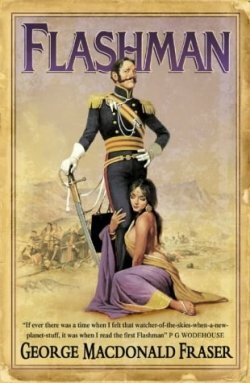 I am re-reading the first Flashman Packet – Flashman – edited by the genius that was George Macdonald Fraser. I have read all of the packets except Flashman and The Tiger. It was not the last one published, but it was the last in chronological order of Flashman's adventurers – and although I have the book on my shelf, I have deliberately not read it as yet. I'm just not ready to end the story. GMF died in 2008, and there was high hopes that he would write another installment of the "poltroon, cowardly liar, and cheat" and anti-hero which have enthralled the reading public for the last 40 years. Whilst I may have left "Flashman" for some rest, I did not abandon Fraser per se and have read most of his other works in recent years, such as Mr American, an evocative, slow, and outstanding aspect of England on the cusp of change – one that stepped from the Victorian to the Edwardian era. Indeed, the elderly Flashman makes a brief appearance, losing none of his roguish and outrageous behaviour even in his twilight years. Quartered Safe Out Here was Fraser's autobiography of life as a soldier fighting the Japanese in the jungles of Burma. It is notable that it was from the squaddies perspective, a no-hold barred account of camaraderie in an environment of hell. Contrast that with Fraser's remarkable wit which he displayed in The Pyrates, which was sheer escapism and a homage to the 1940's and 50's Hollywood portrayals of pirates buckling and swashing with derring doing on the high seas, where "men were men and women knew it". The Steel Bonnets was a brilliant historical record of the Border Reavers – those that fought and died on the English-Scottish borders in the 18th century. Black Ajax was another great read – but that deserves a seperate post. In later life Fraser vented his frustration and anger at the New Labour government in The Lights out at Signpost which was a lament at what his country had become, and the chinless wonders which ran it. When he wrote his first Flashman novel in 1969, which berated the folly of the First Afghan War and the stupidity of some Victorian generals and diplomats, he could not have imagined that his country would become embroiled there yet again – after all the painful lessons learned. He berated Bush and Blair, and was furious that Britain's knowledge of Afghanistan was so easily brushed aside by the neo-con US republicans, and with the full consent of the then UK Prime Minister. Speaking in 2006 he said "Tony Blair is not just the worst prime minister we've ever had, but by far the worst prime minister we've ever had. It makes my blood boil to think of the British soldiers who've died for that little liar." In our politically correct world, the views of GMF are considered extreme right wing, particularly from the wet liberal establishment. He described the British Empire as "the greatest thing that ever happened to an undeserving world". Yet it cannot be denied that the British fought two Afghan Wars in the 19th century (1839-1842 & 1878-1880), and realised that it was a country that cannot be tamed or changed. The geography, the culture, the wealth of knowledge accumulated during those times have not altered. Even the Russians realised that – 100 years later. But Bush and Blair chose to ignore it. In 1837 the British – fearing (falsely) a Russian encroachment to reach India – placed a puppet ruler in Afghanistan. But he controlled Kabul only, and the various tribes elsewhere merely bided their time, and took payment from the British to remain calm. The tribes controlled the Kyber Pass, and the British needed that pass to prevent the perceived Russian threat. The British governor thought that cuts could be made, so reduced the payments to the tribal leaders at which point they chose to rebel. The British ended up fighting the Afghans – not the Russians – and suffered their worst defeat. "The Retreat from Kabul" is well documented. Today, ensconced in Kabul is another puppet – re-enforced by the USA and Britain – his name is Hamid Karzai and he is as helpless as Shah Shujah who the British appointed for the same role 170 years earlier. Outside of Kabul the tribal machinations gather and plot – waiting and watching, ready to strike. The weapons may have changed, the information technology is more advanced, but the Afghan has not changed. Afghanistan has not changed since the first British soldier set foot upon it in 1838. Which brings me back to the first "Flashman" novel. When I first read it, apart from it being an entertaining read, the story of the First Afghan War was just an educational history lesson crucial to the plot. But that was before 911, Bin Laden, and the Blushairite Laws of Global Stability. Reading it again, the author (Flashman or GMF – choose as you will) had created a fictional observer in a factual event who has undertook methodical research about Afghanistan and British policy during a certain time in history. Bush has gone, Blair has gone, and we now have Cameron and Obama. Two more actors on the stage – both pretend to be tough, both pretend to connect – yet both are as useless as their predecessors. I don't know which is as bad as each other, but they would all make a great barber shop quartet. "There's been some rum talk in recent days of a squirt called David Cameron matching up to Harry Flashman. The cheek, I say! Only this week at prime minister's question time – still the same old nonsense, never changes, not since Gladstone's day – that young chap Edward Miliband announced "Flashman is back". Well, how do you think Flashy felt about that? This Cameron has pink cheeks, slick hair and I'd bet two shillings to the pound he's never been further east than Calais. I know the type – seen it all before – costly school, well-connected friends, stuffed full of prim nonsense about the nobility of society and now, just because he cracked some damn-fool joke in the House of Commons, everyone thinks he's a proper bully. I know a man when I see one and that Cameron has never run away from a fight over the hills of Kandahar and it's an insult to Flashy to suggest I'm anything like him. I've half a mind to search out young Miliband and trounce him (I served his older brother once, out in Kabul during the Helmand campaign, and know that family always ducks a challenge). No doubt I'm uncharitable, but Westminster seems to be run by a gang of chaps without hair on their chin who've never done a hard day's work in their life. I say to hell with the lot of them – though there is one, the Hon Gideon George Osborne, who's more my type, got a spark in his eyes, out for what he can get. If there's a Flashman among all of them in the Commons, it's him. A Flashman in Number 10? Fun at last! As an ardent fan of the Flashman Papers (and what free thinking non-pc reader couldn't be?) I was surprised to learn that the Labour opposition have nicknamed the UK Prime Minister "Flashman". What we don't know is whether they refer to the fag-beating cowardly bully of "Tom Brown's Schooldays" or George Macdonald Fraser's reinvention of Harry as a lovable womanising, unscrupulous bounder and downright heartless villain. As Quentin Letts, the Daily Mail's parliamentary sketch writer has commented, he suspects it's the latter, and far from being an insult, it may rebound on them and give David Cameron a kudos akin to Margaret Thatcher's "Iron Lady" badge, which was originally intended as an insult from the Russians. I haven't been writing politically on this blog for many months because I'm still euphoric that the old new-labour government was finally dispatched to the opposition benches in the House of Commons. Also, twelve months is still too early in my book to complain about the new kids on the block. For gawd's sake give them a chance, we've just come out of 13 years of misery and incompetence. As for the Lib-Dems, the other coalition partner, it comes as no surprise that they are the juniors in this relationship, and they are still shell-shocked that they are actually in government. The liberal following are now complaining about the ineffectuality of their leader Nick Clegg, without whose performance during the TV debates a year ago, would not have taken votes from the tories denying Flashman an overall majority. They could have joined Labour, but that would have looked like a stitch up and the country would not have stood for it. The other alternative was for the Tories to govern by minority, effectively stifled, and making compromises until a new election could be held five months later, when they would hope to gain a majority. That may well have been the better idea in hindsight, especially as the Labour Party was in disarray, and more concerned about throwing out old baggage for new. All I can say is that if David Cameron is Flashman then Ed Milliband is the pious, misguided and obnoxious Rugby School headteacher Dr Arnold, and Nick Clegg is non other than Tom (nice but dim) Brown. I know which one gets my vote!